Let’s assume you’ve just given a speech to your favorite business organization… you were AMAZING! Everything went perfectly, and the attendees loved the content you shared! The audience connection was deep, and you even received a standing ovation! And, the best part? You remembered to hit the ‘record’ button! OH! The things you can do . . . just keep reading! You never know when you’re going to be giving the best presentation of your life. 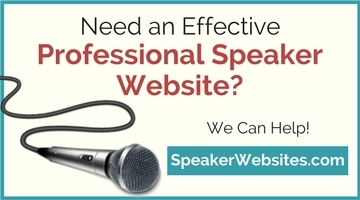 And, if you record every speech, you’re sure to end up with some amazing video clips for your next demo video! Choose clips that demonstrate your ability to provide solid content and connect with the audience. Hire somebody on Fiverr.com to transcribe your video. Then create a workbook and use a site like Udemy, Teachable, Kajabi, or Thinkific to set up an online course. Many of these services offer special pricing for new customers. Every time you present a new topic, create another online course. Eventually, you’ll have a whole ‘university’ of content to sell! Yet another use for your transcribed recording… turn it into a chapter (or chapters) in your next book! Of course, you’ll probably need to do some editing beforehand, but what a great way to ‘write’ a lot of book content! People love freebies! 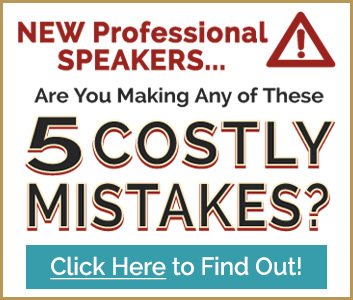 Encourage attendees to sign up for your newsletter list (or give you their business card), and you’ll send them the audio recording of today’s presentation. Make it clear whether you’re adding them to a list OR if it’s just a one-time sending — and make absolute sure you have permission to do it. Remember that online course I mentioned earlier? Consider taking it offline. Create a DVD or thumb-drive product that includes your workbook and the audio or video recordings. Not everybody has a speedy internet connection that’ll allow them to learn online. This is a great alternative for those who still want to learn from you, but don’t want to deal with an online class. If you’d rather not create a formal online course or home-study program, you might consider using your recordings to publish weekly video tips on your YouTube channel. Keep the tips bite-sized — 3-4 minutes at most. And, of course, be sure to post each one on your blog and share via social media. 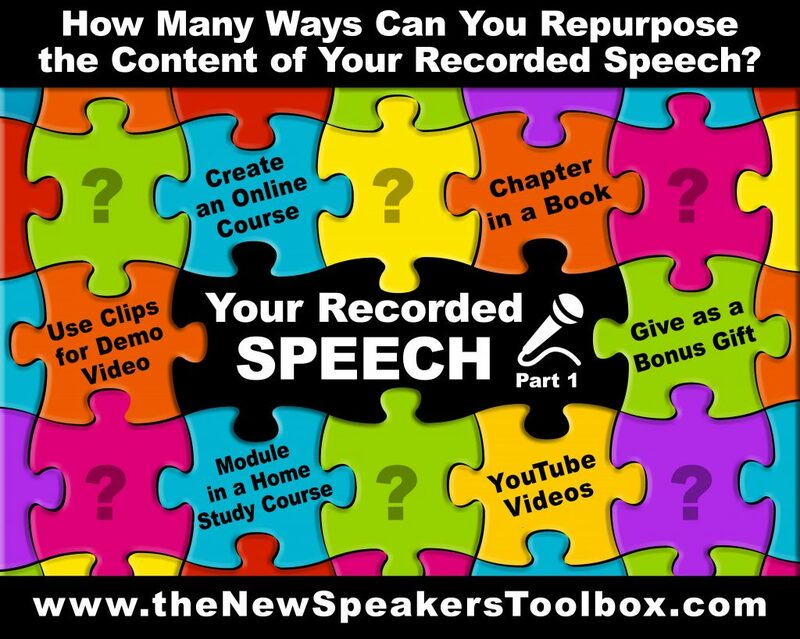 These are just six ways you can re-use your speech content — and it all begins with RECORDING it in the first place. No matter the size of the audience, always make a recording. You might even consider investing in some high-quality video and audio recording equipment. You’ll be thankful you did. Great suggestions as always Cynthia!